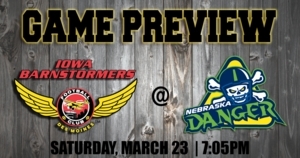 DES MOINES — The Iowa Barnstormers (2-0) hit the road to try and make it their third straight win to start the season against the Nebraska Danger (1-2) on March 23. Kickoff is set for 7:05 p.m. CST at the Heartland Events Center. The Barnstormers are coming off a bye week in week four, but won their second straight and their first at home on March 9, beating the Green Bay Blizzard 41-3. Iowa put on a defensive show against the Blizzard, holding Green Bay to zero touchdowns. Defensive back Jourdan Wickliffe was awarded IFL Defensive Player of the Week after forcing two fumbles and returning a pick-six for 49 yards. Quarterback Daquan Neal also threw four touchdown passes on offense. The Danger are also coming off a bye week in week four. Nebraska lost its last game to the Sioux Falls Storm on March 9, 55-36. Quarterback Tommy Armstrong Jr. was the lone bright spot for the squad, running for four touchdowns and throwing for another. After winning their first game against the Bismarck Bucks on Feb. 23, the Danger are on a two-game losing skid and look to get back on track. The Barnstormers went 1-1 against the Danger in 2018. Iowa lost the first contest in March, 43-32, but went on to win 41-25 in April. You can watch the two teams’ first matchup of the 2019 season live on YouTube with the stream starting at 7:00 p.m. CST.